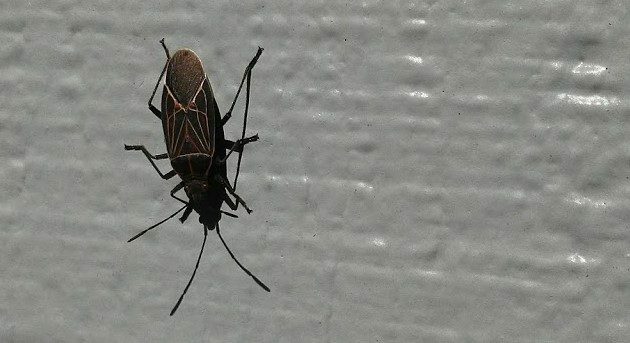 A boxelder bug seems to enjoy the warmth on the siding of a North Albany house on a recent sunny day. Springtime is good news in many respects, not the least of which is that it also means the beginning of the end of the annual visitation by swarms of boxelder bugs. “The boxelder bug frequently becomes a nuisance pest around homes and buildings…” So begins a Penn State Extension tract on insect advice. A nuisance? No kidding. Around this time of year, the main good news is that after overwintering wherever they can get inside and out of the cold, they are about to leave again and buzz back to the maples — or boxelders if there are any — on which they feed and lay their eggs in the spring and summer. Then, in the fall they may be back, of course, swarming on surfaces warmed by the sun. To keep them from getting any further, we’re supposed to seal all the cracks in the walls. A good idea, obviously, but chances are we’ll miss a crevice or two. And the boxelders will probably find the cracks we missed. One way to kill lots of them before they get inside is to spray them with soapy water while they’re massing on the outside walls. It does work, actually. And if they do get inside, keep a vacuum ready to scoop them up. Sounds like a stink bug. Perhaps global warming is playing a role in the box elder bug decline. We have seen literally thousands (millions?) of them in the last couple of weeks. We have over 40 oak trees around our home on one acre near Jefferson, and also one huge maple tree. They aren’t a nuisance unless they come in the house! Thanks for this post Hasso, it was most informative. That’s what was continually coming in my house last year. Annoying. Thanks. Didn’t know what they were.